Kyary Pamyu Pamyu does a backflip at her haunted house-themed Halloween live! “THE SPOOKY OBAKEYASHIKI ～PUMPKINS STRIKE BACK～” is the name of Kyary Pamyu Pamyu’s first ever Halloween solo live performance, which took place at Tokyo Metropolitan Gymnasium on Sunday 28th October. Over the course of two days, approximately 10,500 fans turned up to the eerie event, the theme of which was a Japanese haunted house. You will only ever have such an experience at a Kyary event! Kyary smashed through some new challenges for this performance, entertaining the crowd with breakdancing and much more! At first, Kyary strongly denied the absurd demand of the demons, but she reluctantly agreed when they taunted, “If you refuse, we will cast a curse onto this audience”. 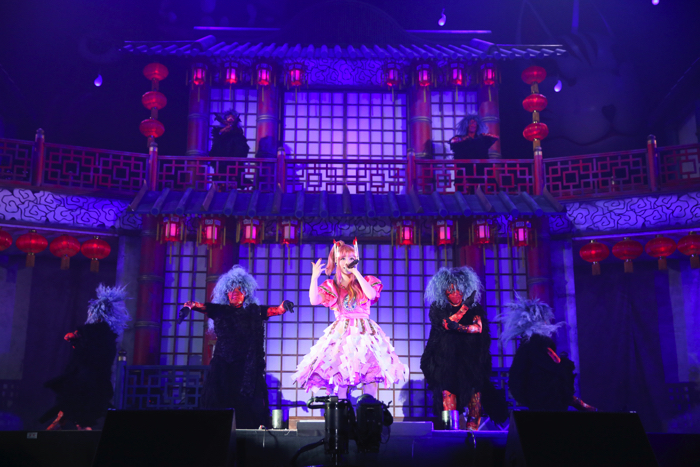 With that, the spirits illuminated the stage and in an instant, Kyary’s clothes had changed into a horror-themed costume! When the movie clip finished, the background of the stage was transformed into a mansion. Kyary kicked off her live with Fashion Monster, followed by CANDY CANDY, and Invader, Invader. She dressed in an Asian-style costume – long hair and a red dress with a lantern print. 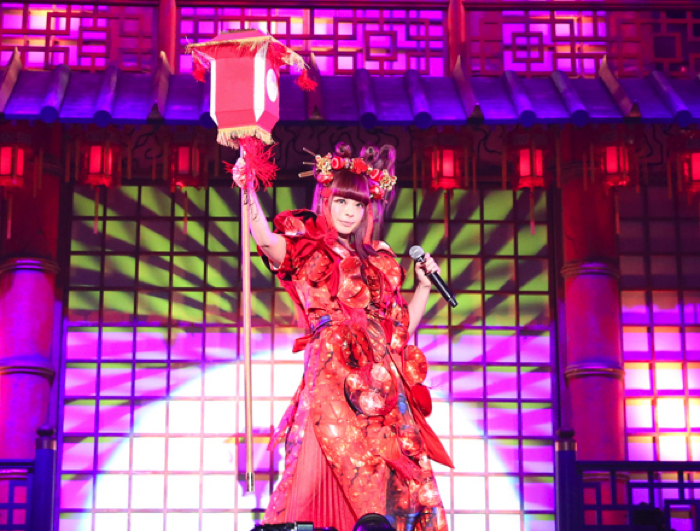 However, the spirits urged Kyary to scare the crowd and were disappointed when they seemed to be having fun. In a flash, Kyary was then in a crow costume. She was wearing skinny pants and a top that was decorated with black wings. She made an appearance before the audience midair, and was also wearing heels. This was the most mature Kyary had ever looked! Kyary then sung and danced along with slow motion projection mapping technology, creating a unique show. After performing Furisodation, there was a dance showdown with dancers dressed as Sadako from the Japanese horror film “The Ring”. Kyary pulled out some cool breakdancing moves and even topped off her routine with a backflip! 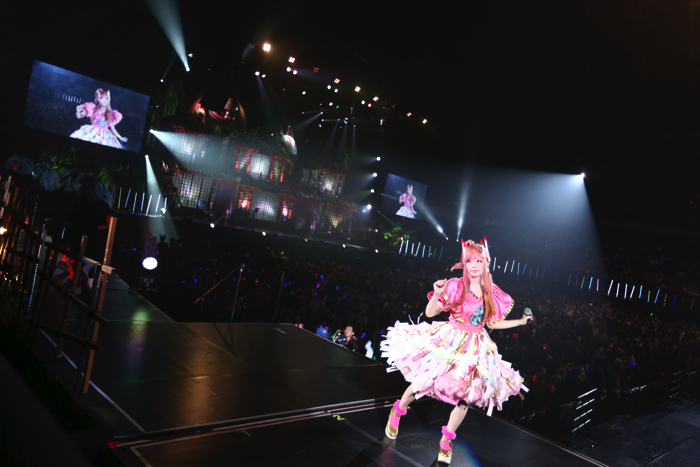 The audience roared with excitement at Kyary’s performance – they had never seen anything quite like this before! Kyary won the dance showdown! She then performed Ninja Re Bang Bang from a wagon in the middle of the arena. 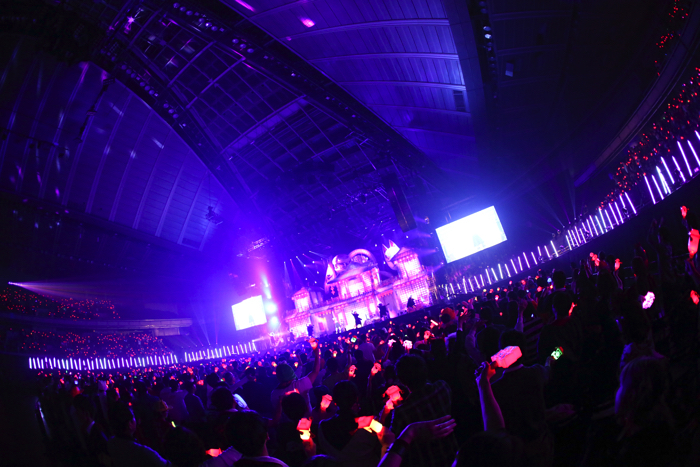 The tension was building up when Kyary performed Mottai Night Land amongst her fans. The spirits also seemed to have fun during the performance. “We’ve always tried our hardest to scare humans…but we actually had fun amusing you all today” they admitted. “By entertaining this crowd, we’ve let go of our grudges. Because of this, we’re able to finally rest in peace,” they explained to Kyary, full of gratitude. The atmosphere became peaceful. Kyary wore candles that were decorated with Swarovski crystals on her head. She was wearing a pink top decorated with fire spirit patterns, and her skirt was filled with paper streamers, transforming her into a cheerful spirit medium! She hopped into the wagon again and performed Easta and Kimi ni 100 Percent, stirring even more excitement in the crowd. It was then time for her question corner. Directly talking her fans, who put a lot of effort into their fashion just for this event, she said: “Every day, I was practicing backflips to the extent that that was the only thing on my mind. This gave me the feeling of returning to my youth,” she said with a giggle. The backflip really added a spark of fun to her breakdancing routine. Cheers of excitement from the audience rang throughout the venue and didn’t stop. 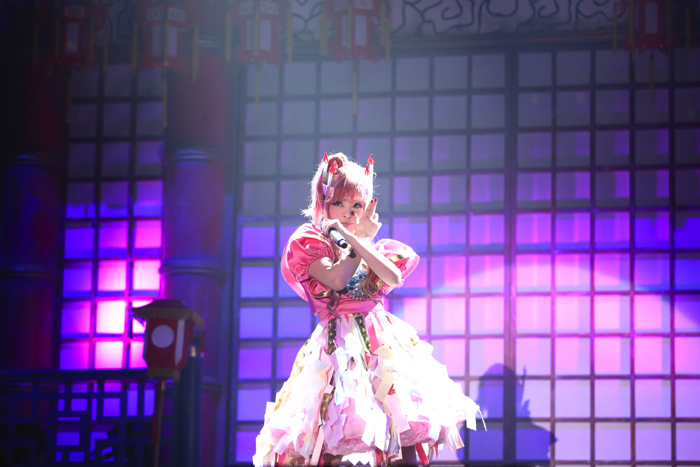 Hearing the excitement of her fans, Kyary performed Todoke Punch and Explorer. 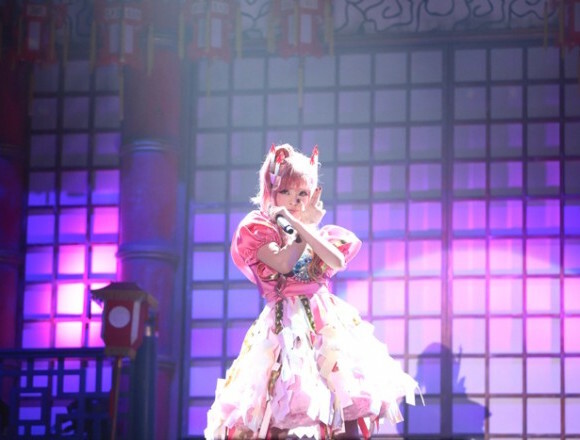 Reflecting on her performance, Kyary addressed the audience once again. “Today’s haunted house theme was a fusion of scary and fun. As a result, the performance ended on a high note! I also faced some new challenges today such as breakdancing! Every time I perform, I build on my skills! 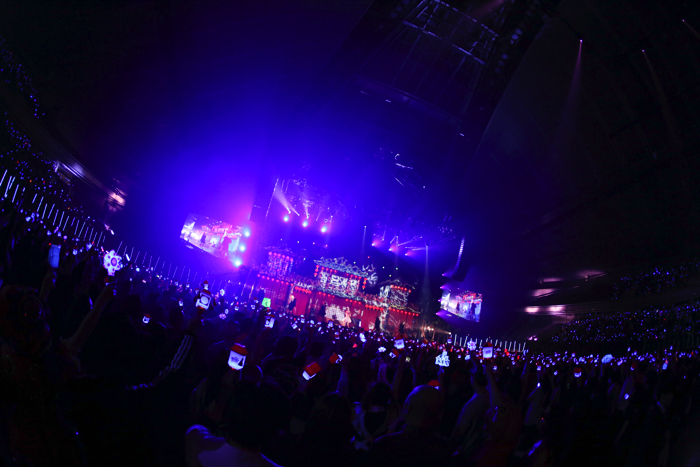 Then, Kyary shouted; “and now we’re gonna finish off with my debut song! Let’s all dance!” and with that, she performed PONPONPON. The three spirits, the Sadako dancers, the monster dancers, and all stage dancers took to the stage, creating a finale that engaged with her audience. With that, Kyary’s Halloween live had finished. The use of an extravagant set, the story and the music all combined made for a smooth live that was as fun as watching a musical! Kyary also improved herself as a performer with her breakdancing. What will she do next? You’ll just have to wait and see!